Flowers are a popular and stunning way to dress up any scrapbooking layout or handmade card. There are literally hundreds of different flowers to choose from including flower stickers, flower rub-ons, three-dimensional flowers like those from Prima, chipboard flowers and so much more. Why not have a go at making your own unique and personalised flowers from your favourite scrapbooking papers and cardstock too? 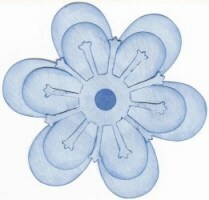 With our scrapbooking flower template, it's easy! You can create gorgeous accents like this in minutes! To use this template, simply print it out. You can print directly onto the back of the paper you with to cut out. Alternatively, you can print it on another piece of paper and trace it onto the item you wish to cut. You can also resize the image using any graphics program to get the exact size you want for your creation. Try combining different colours and patterns to create the effect you want. There are many different ways to add your own personal touch. For example, you could outline the edges with a gel pen or ink the edges with an ink pad to make your flowers pop out from your page. You could also use glitter, embossing powder or diamond glaze to give them a more sophisticated appearance. Now that you have made your flowers, it�s time to decide how to arrange them on your scrapbooking layouts and cards. A single large flower can make a beautiful centrepiece but why not consider making your own arrangement. Combining several flowers of different sizes and maybe even made from different papers can create a spectacular effect. Mix in a few flower stickers, flower rub-ons or even brads for texture and contrast and you are sure to come up with a complete stunner. Play around with your flowers. You never know what you can create until you try! 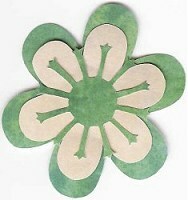 And most of all, have some fun with your scrapbooking flower template!